I’ve had the wonderful Spanish ñ on my mind lately (see e.g. here), and today decided to make a list of reasonably common Spanish words that use this characteristic letter. This started as a plain list of 57 words. Then I added translations. Then I couldn’t resist going back in time: I knew that the ñ sound had several different origins, but was curious to see how this worked out statistically. The results are below, in tabular form so you can play with the words yourself if you like. The table is sorted by Type, meaning the type of the word’s origin; within each type, words are listed in alphabetical order. The types themselves are ordered by frequency. The next most common origin is a Latin double nn; this is the source of the tilde (~) itself. Pleasingly, the suffix -eño has a dual origin, with one derivational path of the ne/ni type (seen in words like isleño) and another of the nn type (seen in pequeño). The third group is a Latin gn or ng sequence. I knew that some ñ‘s came from gn, but the ng words were a surprise. Next are words borrowed from other languages. Here we find words that begin with an ñ, from languages as disparate as Quechua, Dutch, and Italian. The mn group could really be collapsed under nn, because these words passed through an nn stage before emerging with an ñ. Some words on the list were internally derived from other Spanish words. For example, caña ‘reed’ gave rise to both cañón and cañada. Finally, one word (rebaño) is of unknown origin — too bad I missed it when writing this recent post — and one (cariño) has a known origin that doesn’t seem likely to produce an ñ. This entry was posted in Sounds and tagged eñe, etymology, palatalization, Spanish, tilde on 13 March, 2018 by jhochberg. I hope that you will all visit this website and spread the word about the project. This entry was posted in Vocabulary and tagged etymology, OEDoS, Spanish, vocabulary on 21 August, 2016 by jhochberg. A stray comment on /r/Spanish got me thinking about muñeca, the word that, bizarrely, means both ‘doll’ and ‘wrist’. The ‘doll’ meaning is primary. It’s the one listed first in dictionaries, and if you do a Google image search on muñeca, you see more dolls than wrists. It’s the first meaning that I learned, since ‘wrist’ is one of the less important body parts. When I eventually learned the second meaning, I was surprised that one word could have two such completely unrelated interpretations. I’ve just looked up the history of muñeca in my can’t-live-without-it etymological dictionary by Joan Corominas. 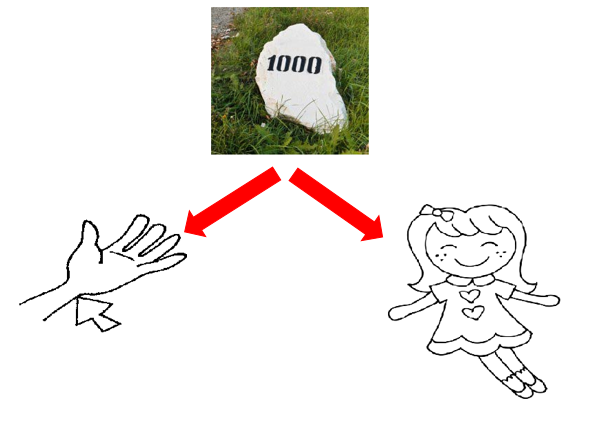 It turns out that the word’s original meaning was neither ‘doll’ nor ‘wrist’, but something entirely different: ‘milestone’, in the physical sense of a road marker. Muñeca ‘milestone’ turns into both ‘wrist’ and ‘doll’. How did this bizarre transformation take place? According to Corominas, the key was the interpretation of a milestone marker as something that sticks up out of the ground: a bump, or using fancier English, a protuberance. The word was then extended to ‘wrist’ because the wrist bone protrudes from the arm. The road to ‘doll’ began with the extension of muñeca to a bumpy bundle of rags, and from there to a rag doll, and then other dolls. Muñeca‘s original meaning of ‘milestone’ has been lost from everyday discourse, but is still included in the Real Academia’s dictionary — but only after ‘doll’, ‘wrist’, and other meanings related to ‘doll’, such as ‘cadaver’ and ‘bimbo’. Incidentally, the earlier history of muñeca is obscure. It is not Latin, but seems to come from a pre-Roman language, possibly Celtic. This entry was posted in Vocabulary and tagged etymology, muñeca, Spanish on 19 May, 2016 by jhochberg. Recently I’ve been playing with John Slocum’s terrific Indo-European Lexicon website and wishing I’d discovered it earlier. 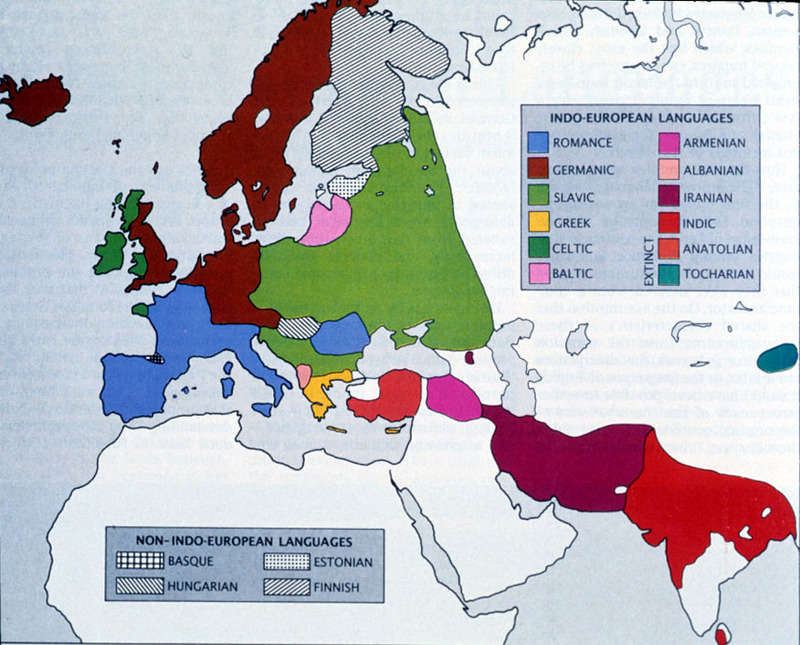 In case you didn’t know, Spanish and the other Romance languages are part of the Indo-European language family. Other branches of this enormous family include Germanic, Greek, Celtic, Slavic, and Indo-Iranian. 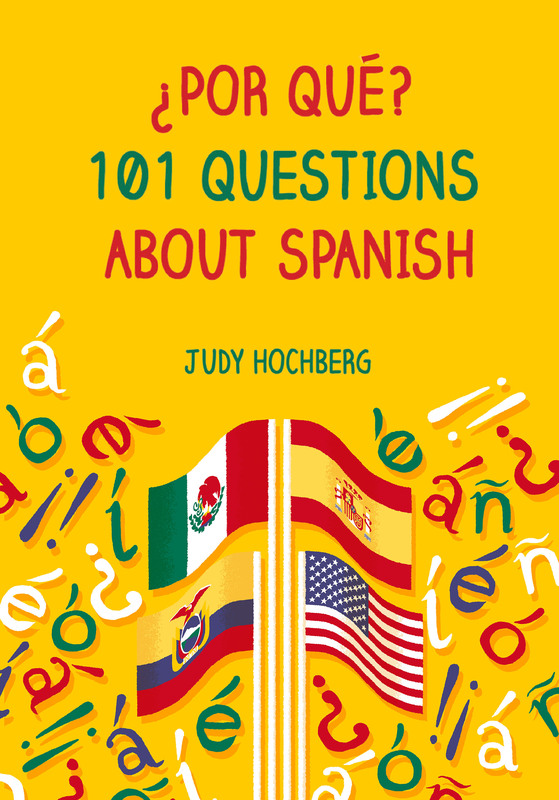 Spanish is therefore related to language as diverse as Gaelic and Gujarati; to Sanskrit, Serbian, and Swedish; to Pashto, Persian, and Polish; and to Hindi and Hittite. Dr. Slocum’s Lexicon lets you trace vocabulary roots up and down the Indo-European family tree. For example, let’s say you’re curious about the origin of the Spanish word pan “bread”. If you click on the Language Index you can then scroll down to Spanish. (For a shortcut, you can access the Spanish page here.) This page lists almost 500 Spanish words whose Indo-European roots are included in the Lexicon. Pan is traced back to the Proto-Indo-European root pā-. Click on that root and you’ll move up the tree, to an entire page devoted to pā-. This page provides a definition and a list of the root’s descendants in all ten branches of the Indo-European family. It turns out that pan is related to several sets of English words. I knew about some of them, but not all. For other words, though not pan, tracing a root back down the tree can show you surprising connections within Spanish. For example, llama “flame” and blanco “white” share the same Indo-European root, as do armisticio, arrestar, asistir, costar, estado, and estar. Why are you still reading? Run along and play! This entry was posted in From Latin to Spanish and tagged etymology, Indo-European, Proto-Indo-European on 9 February, 2014 by jhochberg.